Meet The Actor Who Plays Hans Strudel in the Toaster Strudel Commercials. Home → Across America → Meet The Actor Who Plays Hans Strudel in the Toaster Strudel Commercials. “Some Americans called it ’Gestapo’ and they did not like the one commercial where I kicked down the door and it looked like I barged into the home of innocent people. I don’t see what was wrong with that.” [Gregory Von Straussen aka Hans Strudel]. 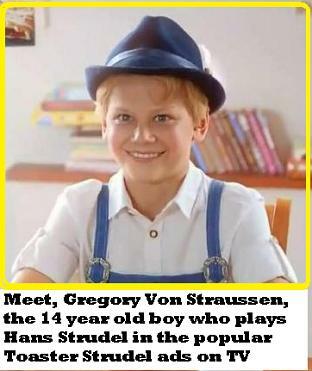 Yes, folks, Gregory Von Straussen is the young actor with the angelically Aryan good looks who landed the job of playing Hans Strudel in the Toaster Strudel commercials. It’s one of the most aired commercials in all of American television. On a recent trip to NYC people pointed at him and called him Hans Strudel. He even signed about 100 autographs in one day, and he was gracious enough to sign each one with the name of the character he portrays. “I had to invent a completely different signature for Hans Strudel because Americans didn’t seem to care that I had a real name and that my character in the commercial is not my real identity,” said Gregory in his very thick German accent from the large A-Frame log house he shares with his parents in Innsbruck, Austria. TheDamienZone.com figured that Gregory was grown up enough to answer some pretty adult questions, and when we asked him about the complaints the Hans Strudel commercials were generating in certain circles, Gregory was eager to answer. Currently, Gregory is doing a series of TV spots for a Kosher sausage company that will air throughout most of the German speaking world and he is also filming Italian and English language versions. “My new agent is a nice man named Morty, and he thought that I should try to appeal to a bigger audience because I cannot make a name for myself just talking about Toaster Strudel. “Do you know that most Americans do not eat Toaster Strudel, and what is even worse is that they do not eat any breakfast at all? “I cannot believe that. How do they get to school and do their calisthenics with any vigor? Gregory’s parents, Vilhelm, a fighter pilot in the Austrian Air Force, and Gretel, a piano teacher, are proud of their little Gregory. They plan on sending him to Munich to finish his secondary schooling and then hopes are that he will attend Harvard University in the USA or Oxford in England. Currently, Gregory Von Straussen is the smartest kid in his class and his IQ has been measured to be 159 — which is well beyond the genius range. All the kids love him. He’s smart, he’s cute, he’s famous and he gets the school endless amounts of free Toaster Strudel. EDITORS NOTE: IT IS VERY EASY TO COMMENT ON THE DAMIEN ZONE. WE DO NOT PUT YOU THROUGH A LONG PROCESS OF SIGNING UP AND VERIFYING EMAILS. THE DOWNSIDE TO THIS IS THAT IT MIGHT TAKE SEVERAL HOURS FOR YOUR COMMENT TO APPEAR. SOMETIMES IT TAKES A FEW MOMENTS AND SOMETIMES IT TAKES HOURS — BUT IT WILL APPEAR — WE CAN ASSURE YOU. WE WELCOME ALL POINTS OF VIEW AND SOMETIMES ONE OF THE THE EDITORS WILL ANSWER….EVEN IF YOU INSULT THEM. Bengt Holst is Mentally Sick? Sanity of Copenhagen Zoo Director In Question. You say plainly in the disclaimer on your About page that you use “invented/disguised names” throughout the site often, so are we really meeting anyone? The boy sounds smart, articulate and endearing by your account, but if this is really just fabricated material for the ‘stupid people’ then I wonder at the hollowness of the piece. Should this be the case could you direct me to any existing real interview with the young human face behind Hans Strudel. My own kids find his commercials humorous and intriguing. Gregory seems like a wonderful young man. I don’t understand why all of the Nazi overtures are being placed on this poor kid. There are plenty of people in the US with blond hair and blue eyes! I wish this young man nothing but the best. I agree with his agent that it would be in his best interests to be known as something other than just “Hans Strudel”. Then again, Florence Henderson will always be remembered here in the U.S. as “Carol Brady”. Gregory seems bright and dedicated enough to pursue life after acting, though. I wish that people would recognize him for his positive traits instead of demonizing him as some sort of monster. Fair enough, thank you. Good detective work. He’s certainly a vast improvement over Pillsbury’s first disturbing incarnation of Hans Strudel. It’s not fake. That’s the real kid. He was on American TV on a morning show and he said the same things to the newsman that he said to the writer of the article. He even caught Lyme disease from you, inspector. I think he’s great. I’ve been to Vienna and hope to get back there one day; absolutely wonderful and the people are awesome (better than Germany but don’t tell the Chancellor!). It’s great to see that he wants to have a bunch of children and that his goals are realistic. If I could tell him one thing, skip Harvard and go to Oxford! I was wondering, does gregory play both boys in the toaster struedel commercial? The other boy sure looks like hans struedel! What t.v show/episode did he play in? I would really like to know. I just wanted to now,damn.Why not? I wasn’t talking to you when I said “weirdo” — I deleted the comment ahead of yours where someone asked me a strange and crude question. The way to find out if anyone has ever been on TV and if so where, when and all you need to know is on a website called IMDB.com — that is the Internet Movie Database. It is the most important website in all of show business aside from theater. Just go there and search — even the most obscure people are listed — you can search every movie, tv show, actor, actress — anything. Gregory,My whole family and I think you are cool. Funny and wacky in the best way in the commercials.Wish you all the best ! Cute kid, but the commercials are a bit silly mostly the only one where he knocks down the door and the other boy gets carted away by birds. Just plain silly. Great marketing technique, admire Gregory for capitalizing on his endearing personality and cuteness but with an IQ of 159 I’m sure he’s read the ingredients of the product he advertises and hope he moves on, lands some great movie roles and considers endorsing healthy food. Americans really don’t need any more encouragement to gulp down even more sugar/bad fats. Shame on you Pilsbury. But good luck to you, Gregory, you rock! You know what Nons — you’re a sicko. Your sickening comment came the closest to not getting allowed on here because not only are you a numbskull — you’re a killjoy too. Gregory is a beautiful child and I love him in the commercials. I enjoy looking at him everytime and he cheers me up. He seems to be a fine young man and I admire his intelligence and wholesomeness. I wish him the best and there is no need for any negative comments. People who make negative comments are extremely ignorant and JEALOUS! What’s the problem with the new toaster strudel boy commercials. I think they are a breath of fresh air for toaster strudels. Good acting Gregory. People will always find something to complain about because they are unhappy with themselves. At first I found this little boy kind of creepy and scary looking; and his voice annoyed me. So I’d try to mute the tv before he started yodeling or something. And worst of all, I would start craving toaster strudel. I only buy the stuff every other year or so, and I think I’m about due. Mmm strawberry! I like the little guy now, Gregory IS cute, and he is so helpful; bringing happiness to everybody’s breakfasts…or late night snacks. Thanks Hans Strudel…we love you. Never mind the fact that he called, Americans ,flaky,right? I smile each time I see the toaster strudel commercials because Gregory reminds me so much of my nephews in the Czech Republic. Not only do they look very similar but they also have the same sense of positivness about getting a good breakfast and doing your best in school. Hope Gregory is able to do more commercials! If American kids ate toaster strudel for breakfast, they would be able to do their calisthenics with vigor because of the sugar high, but then they’d fall asleep in first period once the high wore off. I know, Mabel. His descriptions sounded too Aryan too me — and who uses the word calisthenics nowadays? Yes, John., the actors Lukas Ridgeston and Dano Sulik are both from the Czech Republic and they have the same kind of life energy and work ethic. Why did he call American’s “Flaky” That’s disrespectful, I mean we’re not teasing him about that creepy look on his face in those ridiculous ads are we? He was making a joke about the word because earlier in the interview someone said that his character was a “little flaky” and he asked what the word meant in that context. Moments later he re-used the word jokingly. Don’t be a hater, Mabeline. I’m definitely not a hater Damien, I was kidding as well… Try not to be judgmental, OK? that you can be happy with. Breakfast is the most important meal of the day! I think the kid is creepy… He may say his IQ is 159, but I find it hard to believe when I look at his vacant eyes. Looks like he’s had a lobotomy. Yaaaah? Yaaaah!!! HE IS THE MOST WEIRD KID IT IS CREEPY!!!! I cant watch this , I turn it, It Friggin Weird and I wont eat Toater Strudel. He is a freak! Americans are flaky. I know. I am one 😉 And yeah, I always count on Facebook to get a good feel for public opinion. Mom, we’re probably as demonic over there as he is here… No… probably more. He has a bright future in knowing what he would like to do for college and beyond. Gregory I don’t know why so many people are creeped out by you in those commercials I guess they have nothing better to do than complain about little things like that. I think you are a delightful boy with a great smile. Good luck in the future and continued success in your acting career. Gregory Von Straussen is actor with 159 I.Q. he does not need to rely on acting roles if none other come along, but he does seem to light up in front of the camera and people seem to be attracted to his charm when he appears publicly, with better effort by his agent he could actually have quite a career!!! He is Brazil cloning Hitler.